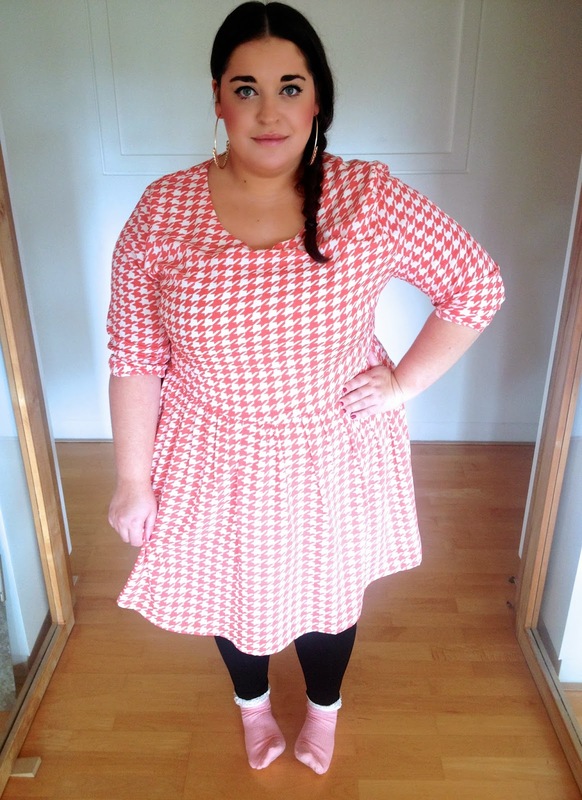 Danielle Vanier: Loving my Lovedrobe dress. Good evening! So, this is my second post here on my shiney new blog and it's just a little outfit post to show you what I wore on Friday. My friend came to stay for the weekend and I wore my Lovedrobe houndstooth dress because it's a nice easy piece to wear and it was perfect to wear during the day and then I tarted it up a bit when we went out for dinner in the evening. I always smile fondly when I see this dress hanging in my wardrobe. The dress was gifted to me whilst I was at a Lovedrobe blogger event and it reminds me of the fab day I had with Becky, Toni and Rosie who are three bloggers I have had the pleasure of getting to know since starting this blogging journey of mine. Urgh, blogging journey....gross. You know what I mean though. Simple styling today with my chavey hoops and side plait. Peach frilly socks add a mature edge to the outfit I feel. I hope you have a good week everyone. Lots going on for me this week! Blogger event on Wednesday hosted by Gok Wan, a meeting with Evans on Thursday followed by drinks with my girlfriends and then it's Plus London on the weekend. Which of your lovely faces will I have the pleasure of seeing at Plus London? You look amazing. I'm going to the Gok Wan event and Plus London! Will be lovely to meet you! Have an amazing weekend at Plus London ! So sad to not living nearer !